Do You Know Old Aluminum Wiring Is Harmful To Your Home? Home/Green Living/Do You Know Old Aluminum Wiring Is Harmful To Your Home? If you ask any electric contractor or an electrician about using aluminum wiring, chances are that will immediately say no and shake their heads. It is now well established that using aluminum is extremely dangerous, as per the Consumer Product and Safety Commission usage of aluminum wiring is 55 times more prone to fire hazards as compared to copper. Such wirings can put homes especially mobile homes which have been built between 1960 and 1970s. The big question is why is aluminum so dangerous as compared to copper? Aluminum has a property of expanding and contracting at a different rate than any other electric wiring. The electric current which passes through the wire changes the temperature, the impact can be great in case of heavy load or small wire. Aluminum heats up very fast and can create a gap when it cools as a result the contact point is pushed away. This results electricity to jump or arc to continue the path, these arcs can be as high as 10000 degrees Fahrenheit which can lead to a major fire. Low conductivity due to oxidation. The main concern of an electrician is oxidation, oxidation is a chemical process which is caused when aluminum comes into contact with oxygen, this process leads to coating of the wire. To make it simpler, it is just like rust which forms a coating on iron when it comes into contact with oxygen. Aluminum oxidizes much faster than any other wiring material like copper. The coating on the aluminum wire makes it electric resistance and results in the heating of wire much more. Aluminum wiring is much fragile which makes it more unfit to be used as electric wiring, you may ask any electric contractor. Aluminum can be easily broken, which can lead to gap in the electric circuit. This further can cause an arc which can lead to serious fire threat. Many connections are created by looping the wire around a screw, after some time these loops become quite brittle which can cause breakage. Aluminum wiring failure warning signs. What are the real warning signals of aluminum wiring failing? To begin with, those houses built between the year 1960 to 1970 should remain always vigilant. The only safety lies in getting your wiring inspected by the experts periodically. The home owners should keep a close eye on the flickering lights or if the lights brighten or fade, the burning smell of plastic and warm outlets like switches etc. other signals could be appliances which normally do not function properly. This is also true that sometimes there are no warning signals. The best option is to completely replace the aluminum wiring by copper wiring using the services of some expert electric contractor. This may prove to be costly and messy as it may require cutting the walls to replace the wiring. 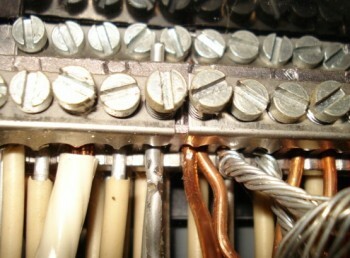 The other cheaper option is reconnecting all of the splices a copper to aluminum connector; it will significantly reduce the danger. It is also true many people are in love with their old homes, it is always better to remodel them and replace the wiring to be safe and tension free. Such steps will totally eliminate the danger of fire and ensure safety of your home and your family.